Once you've customized the time pivot in a Timeline and added pivot headers, you can format the layout and colors of the headers and items. 1. Mouse over anywhere along the right edge of the headers. 2. Click and drag the blue bar to set the desired width. To change the order of a header or subheader, click and drag up or down it to its new position. 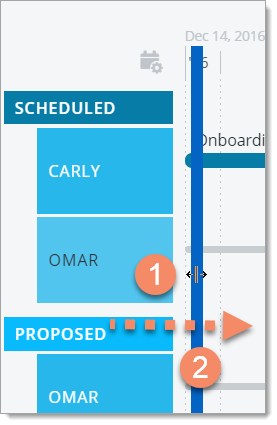 You format a Timeline's layout in the Format Layout tab. To open the tab, click the Format icon on the View navbar. Another way to give your headers more space is to change the orientation of the main header. The default orientation is Horizontal. 1. In the Format tab, find the Headers label. 2. Select the Vertical orientation icon. Another way to provide more screen space for your Timeline is to switch from the default Original theme to the Condensed theme. 1. In the Format tab, find the Theme label. 2. Find the Theme label, select the Condensed theme icon. TIP: The Condensed theme works best with a Horizontal header orientation. By default, items on a Timeline are labeled with their name (Items field). 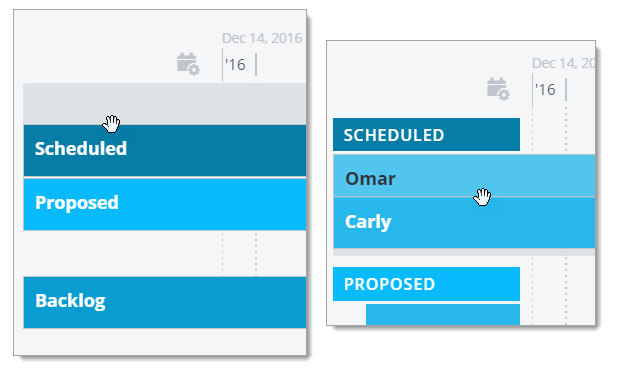 To create an additional pivot in the Timeline, you can select a different field for the label. 2. In the dropdown, select the new field. By default, milestones are displayed in a Timeline together with their date. You can choose to show only the milestone icon. 1. In the Layout tab, de-select Show Milestone Dates. 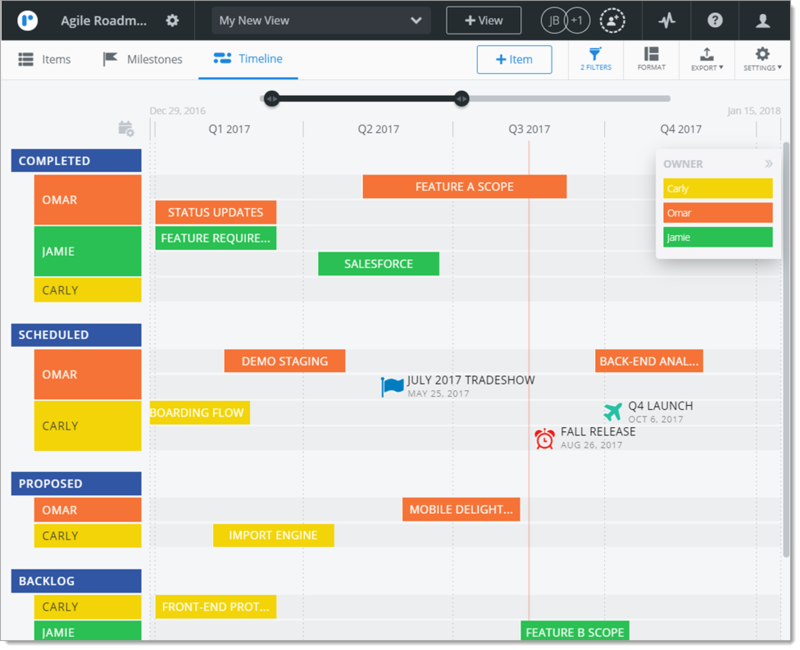 You format a Timeline's colors in the Format Colors tab. To open the tab, click the Format icon on the View navbar, and then click Colors. You have two options when setting a Timeline's colors: Color By Base Color and Color By Field. The default setting is Color By Base using a range of blues. 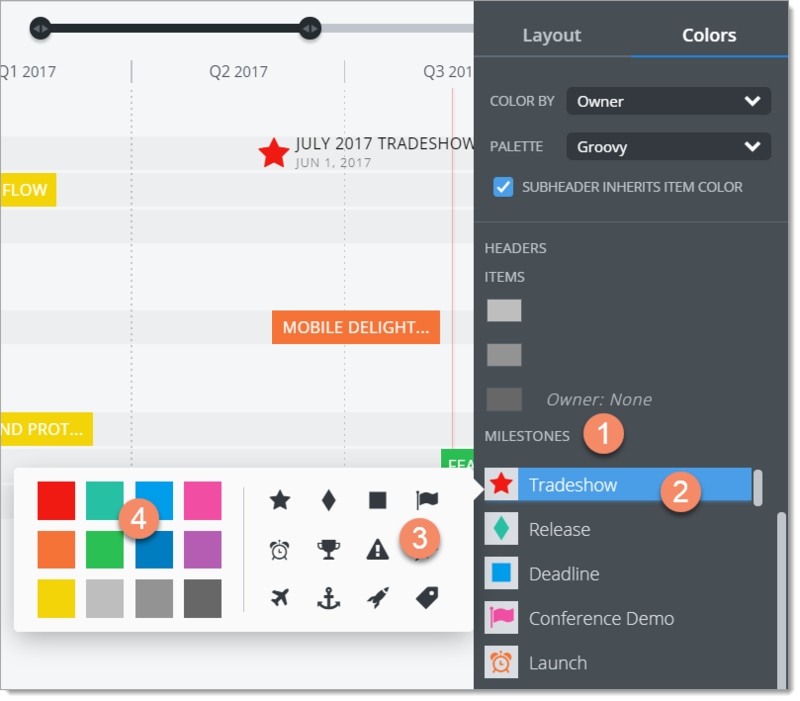 In addition to making your Timeline more visually appealing, Color by Field allows you to create a color-based pivot in addition to the time and field header pivots. 2. In the dropdown, select the field you want to use for the color-based pivot. 4. To make the colors of the Status subheaders match the colors you choose for the items in the Items section of the tab (see step 6), select Subheader Inherits Item Color below the Palette dropdown. 5. In the Headers section of the tab, drag and drop the Header label onto the color you want to apply to the Timeline's headers. 6. In the Items section of the tab, drag and drop the selected field's values (see step 2) onto the color swatches on the left to indicate how you want to color-code the items on the timeline. 1. In the Colors tab, scroll down to the Milestones section. TIP: You can also collapse the Headers and Items sections above. 2. Click the milestone type you want to format. 3. In the flyout, select the new icon for the milestone. 4. Select the new color. 5. Click the Format icon, to close the tab. Here's a snapshot of what your Timeline might look like after your format the layout and colors.